Home » VectorVest » Buy Glencore #GLEN say VectorVest. The stock is trending strongly upwards and offers a compelling growth story. Buy Glencore #GLEN say VectorVest. The stock is trending strongly upwards and offers a compelling growth story. By Alan Green in VectorVest on 16th January 2018 . Swiss based FTSE100 giant Glencore (GLEN.L), formerly Glencore Xstrata plc, is one of the world’s largest global diversified natural resource companies and a major producer and marketer of more than 90 commodities. The Group’s operations comprise around 150 mining and metallurgical sites, oil production assets and agricultural facilities. With a strong footprint in both established and emerging regions for natural resources, Glencore’s industrial and marketing activities are supported by a global network of more than 90 offices located in over 50 countries. Glencore’s customers are industrial consumers, such as those in the automotive, steel, power generation, oil and food processing sectors. The Company also provide financing, logistics and other services to producers and consumers of commodities. Glencore’s companies employ around 155,000 people, including contractors. 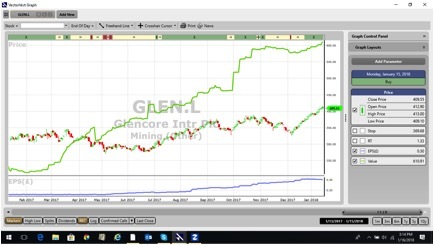 Along with the other large cap resource giants listed on the FTSE100, GLEN has seen a resurgence in value since summer 2017. The mid December dip in the stock flagged the opportunity and trend both across RV (Relative Value) and RT (Relative Timing) metrics. RV, an indicator of long-term price appreciation potential, logged at 1.55, which VectorVest considers excellent on a scale of 0.00 to 2.00. Added to this, the GRT (forecasted Earnings Growth Rate) for GLEN logs at 37.00%, which VectorVest considers to be excellent, and despite a fair RS (Relative Safety) rating of 0.93 (scale of 0.00 to 2.00), at 409p the stock trades a long way below the VectorVest valuation of 610p. The chart of GLEN is shown above in my normal format. The blue line study in the window below the price shows Earnings per Share (EPS) growing strongly. The share is trending strongly upwards after breaking and subsequently testing a 52 week high. Summary: To some investors, mining companies represent a greater degree of investing risk. However, in the view of VectorVest, the sheer size and diversity of the Glencore business results in a relatively safe and stable investment proposition, while a resource hungry world and the EV revolution provides a huge market opportunity and a compelling growth story to buy into. Readers can examine trading opportunities on GLEN and a host of other similar stocks for a single payment of £5.95. This gives access to the VectorVest Risk Free 30-day trial, where members enjoy unlimited access to VectorVest UK & U.S., plus VectorVest University for on-demand strategies and training. Link here to view.